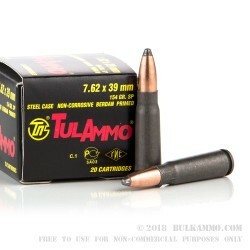 This is an unusually heavy projectile in one of the most proven cartridge designs in history. It expands the potential of the round and makes it a realistic choice for close quarters combat and for larger game hunting. 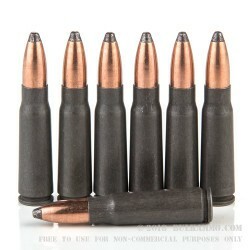 The normal range for bullet weights in the 7.62x39mm round is a very tight 123 grains; 124 grains and 125 grains range. This grain weight is a deliberate attempt at making the round perform better for larger game or for times when velocity needs to be capped to ensure certain aspects of penetration potential and terminal ballistics. 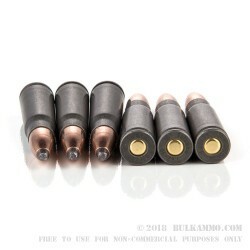 The static ballistics of this round are as stated: 2104 feet per second muzzle velocity and 1540 ft. lbs. of energy, which makes it still potent enough for moderate distance hunting of bigger game animals, say deer, elk, and potentially moose at about 60-175 yards or so. Of course, there is a bit more flexibility on those estimates depending on conditions and size of game. Further uses include close quarters use in a home defense scenario or for shorter range ranch or farm protection. 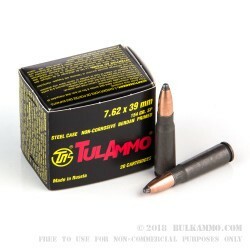 It truly does give you a bit of extra energy distribution given the larger bullet and the soft point design with the still substantial energy rating.